He does not hold a driving license. The moment before the crash happened. 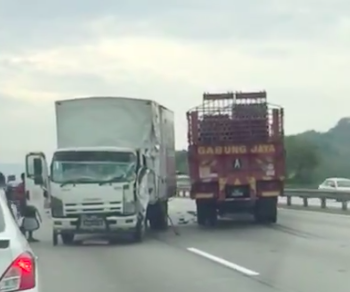 Bernama reported that the 37-year-old man was driving against traffic at Km 432 of the North-South Expressway, near the Sungai Buaya toll plaza at 9.15am yesterday. The man, who was a medicine supplier, eventually collided with another lorry after driving dangerously for about 3km. 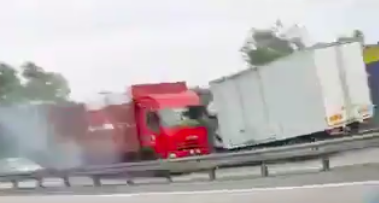 "A lorry that was travelling from Ipoh to Kuala Lumpur in the middle lane spotted the lorry that was driven by the suspect moving towards him," Hulu Selangor district police chief Superintendent Lim Bhak Pai was quoted as saying by New Straits Times. "The 48-year-old man failed to brake and crashed into the suspect's vehicle. No one was injured in the incident," Lim added. New Straits Times reported Lim as saying that the medicine supplier had 64 unpaid summonses, 36 arrest warrants, and 15 cases which required his presence in court. "Cross checks at the police system revealed that he was once charged under Section 379 of the Penal Code for theft," Lim added. While he tested negative for drugs, the suspect has been taken to the Kuala Kubu Bharu Hospital for a blood alcohol test. "The man was remanded for investigations under Section 42(1) of the Road Transport Act 1987 for dangerous driving," Lim was quoted as saying by Bernama earlier today. The case is also being investigated under Section 336 of the Penal Code for an act which endangers the life of others.